The Rusty Dagger: A: ADVENTURE TIME!!! 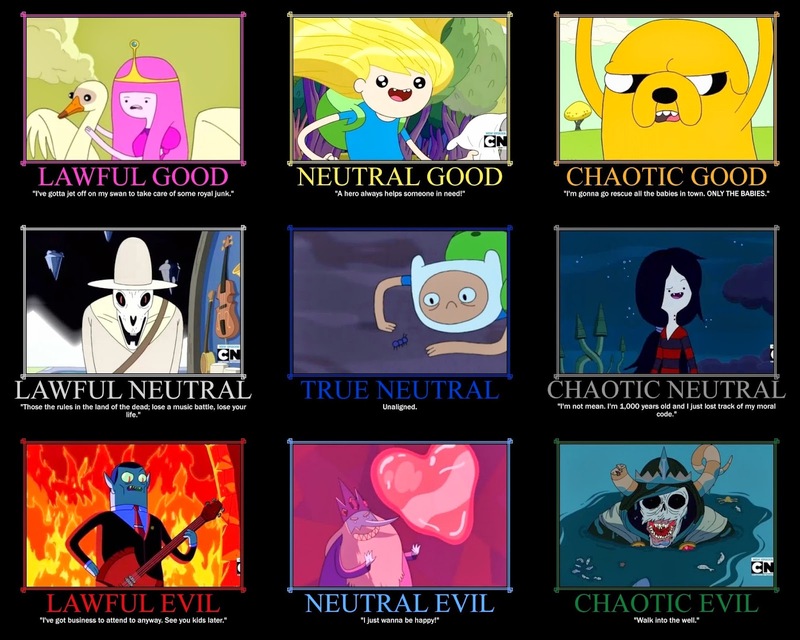 Adventure Time is one of the best shows ever. Full stop. It is not just for kids. Every frame of every episode is jam-packed with joy and love. There really is a lot of heart in Adventure Time, and it tackles some pretty intense and adult themes. One of the characters in the show (The Ice King) is suffering from severe dementia and memory loss- due to a magic crown- but it is an obvious analogue for Alzheimer's disease. The Ice King in particular strikes a chord with me because I have a family member struggling with the disease. Some of the other themes are: coming of age, abandonment, relationships, maturity, innocence, death, fate, fatherhood, family and a multitude of others. I really think that Adventure time will go down as a significant show. One that really broke the mould and is special. Actual scene in the show, not fan art. 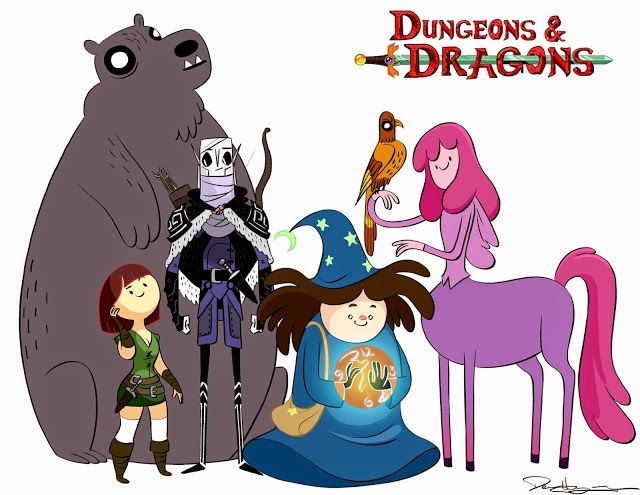 I've seen a few fan rulebooks put out by people who want to play an Adventure Time RPG. 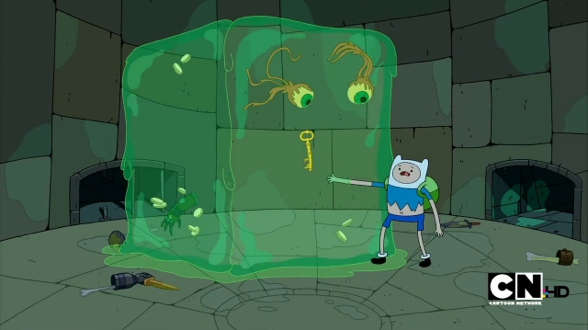 I think it would be super fun for fans of the show to get to play in the Land of Ooo. 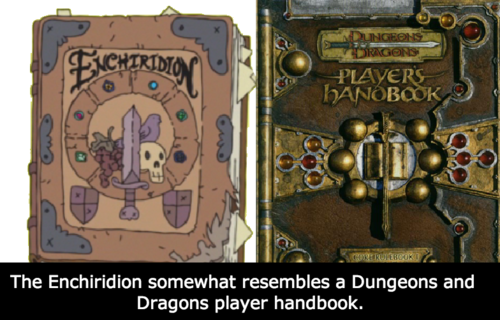 I've actually run a few sessions using a very house ruled version of the Dungeon World rules. The game I visualized was set in the Land of Aaa, an alternate universe. One of the MANY awesome things about adventure time is that is is set on earth approximately 1000yrs after the apocalyptic "Mushroom Wars" nearly destroyed the planet. The "fallout" from the mushroom wars caused magic to return to the world and spawned multitudes of bizarre and magical creatures. Portals and alternate universes and timelines and stuff are a thing in the show so it is easy to create a extremely familiar world for fans, and in which I don't have to worry about messing up the cannon or anything like that. To keep the flavour of the game fresh, exciting and Adventure Timey I decided I would make extensive use of the tables found here at the Dungeon Dozen, both for world building and on the fly in play. The colours will also double as a very loose alignment system. Colorless: No tendency towards the other colours. Logical or random or uncaring entirely. This choice to group things by colour is for my own sanity and to make it easier to make up spells and abilities and such. Good times and plenty of fun. We spent 10 minutes drawing portraits on our character sheets with pencil crayons. Hope to play more soon. Adventure Time is indeed awesome.